So last night, I finally finished dropping down and picking up all the stitches on the back of Aleita, knit the last inch and a half, and sewed up the shoulders so I could try it on. Where do I begin? I guess the good news is that the length overall is ok (I was worried I would need to add length below the waist decreases). 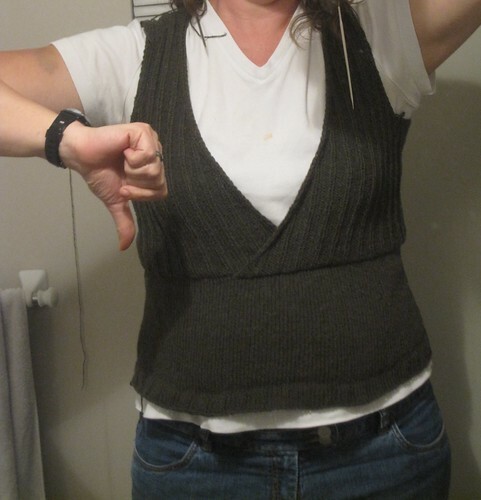 But the bad news is that neckline. Dude. That sucker needs to come up at least three inches. At least. And while I'm at it? 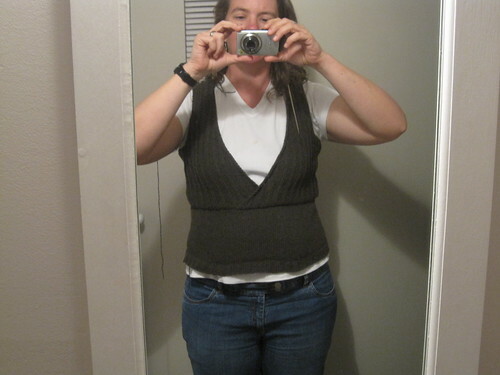 A couple inches longer before the waist decreases is probably a good call. Survey says frog pond. Written by porpoise On April 8, 2009 In "Aleita Shell", "PS Cardinal Directions", "PS North", "frog pond"